Are you planning to introduce a cuddly new bundle of fluff to your older, wiser kitty? 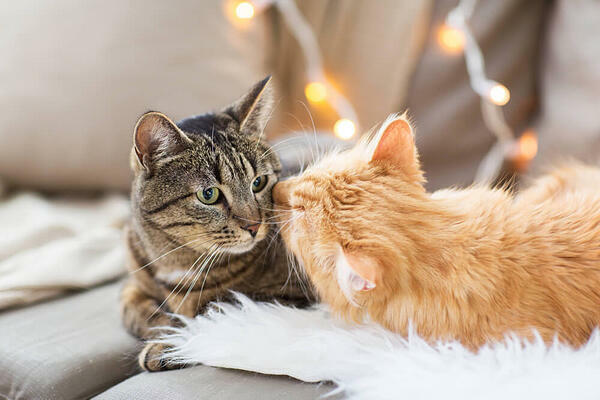 Before making any introductions there are a few things to consider - your kitties can be territorial, and may not immediately welcome a new and unfamiliar cat in their environment! Luckily there are things you can do to reduce any stress and make introductions more enjoyable! Before you introduce a second cat to your home, there’s lots to think about - including whether adding a new kitten is the right thing to do! Remember that cats are naturally solitary animals and, particularly if your resident cat is older, it may be scary to see a new bouncy feline entering their territory or scooting under the sofa to play hide and seek. If you choose to introduce a new pet, don’t let their first encounter be stressful! Instead, make a gradual introduction, giving each time to get used to the other’s scent. Is your new pussycat is going to be a lap cat or an independent cat? Try to get an idea of your new kitty’s personality before it arrives in its new home - you will probably be able to sense this by watching them while they’re still with their feline brothers and sisters. Your new bundle of joy may be very lively when playing, or may sit back and watch all the antics going on! Ideally, your new kitty should be smaller, of the opposite gender and be similarly active as your resident cat. When the big day comes and you bring your kitten home, it may be tempting to introduce both kitties straightaway, but hold off! It’s important to keep both pussycats separate for a while so they can adjust to the scent of a new cat. A good way to do this is to create individual, separate areas for each cat in the house. Each kitty will need their own toys, bed, litter box and food bowls, so make sure you’re prepared. Encourage your senior cat to spend time in a separate room while you introduce your new kitten to the new surroundings. Your new kitty will quickly pick up on the smells around the house and know there’s another feline in residence. You can then swap them around, allowing the senior cat to wander around and, in turn, smell the new kitten’s scent. Remember to praise and reward both cats while they are learning that there’s another ‘kit on the block’! Step two of your pussycats’ introduction is visual contact! Before letting your furry friends loose in a room together, separate them by a screen or a gap in the door. Allow them to meet each other gently - when comfortable with each other they will sniff noses or rub against the door. This is your cue to let them meet face to face! When your pets are ready to meet face to face, always be as calm and patient as possible! Remember that your resident cat needs to learn to share their territory and accept the new kitten. Older cats may also be less tolerant, so introductions should be very short initially before gradually increasing their time together. On the other hand, the new kitten might be very skittish and want to explore, regardless of what the resident cat thinks! Always keeping an eye both cat’s body language. There may be some hissing at first, but be ready to step in if they start to fight! Don’t be surprised if your kitties don’t accept each other straight away. These things take time! To encourage bonding, you can use treats and encourage play when they act calmly and seem happy in each others company. Be sure to pet and praise your senior cat more often at this stage. Reassure them that they are not being replaced but instead are being given a new companion! Even after your pets seem comfortable with each other, keep an eye on them - there’s no guarantee that your cats will bond immediately. Watch for signs of stress and anxiety - decreased appetite, hiding for long periods of time, vocalising, hostile actions or any unusual traits that continue for more than a few days may need to be investigated further! Senior cats might react by sleeping in unusual places or not eating and drinking normally. Make sure your cat can access their litter box easily and that their normal exit routes are always available. It’s also important to check that your older cat’s eating and drinking habits have not changed - senior cats are prone to dehydration, and with a new feline friend joining their territory, they may not drink as regularly as before. If you are at all concerned about your cat, it’s wise to consider speaking to your vet. Cats like routine! Help your pet through this transition by keeping to a schedule for play time, feeding time and sleep time. Your resident cat’s schedule should not change just because she has a new companion. Keeping to the same routine will help your new kitty settle in, and minimise the stress of change for your resident cat. Scent is one of the most valuable communication tools used by cats, and using FELIWAY CLASSIC can help when introducing new cats. FELIWAY CLASSIC can be sprayed onto a clean piece of fabric and left in your pet’s safe area; creating odorless happy messages that help your cat feel comfortable, secure and relaxed in their new home!